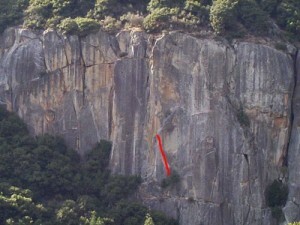 Start with a fingertip traverse and steep edging moves right along the crack. A thin mantel gains the shallow left-facing corner then lieback moves and edging continue to reach the overhang. Get your right hand high then reach up and over the bulge for a left finger lock. Which SuperTopo guidebooks include a topo for Aftershock?